After a particularly frustrating work day and a cooling trend in the weather, I was looking forward to comfort food for dinner. I had a small shoulder roast on hand, and brainstormed over exactly what it would take to make me a happy camper. Since an enormous bank account, world peace and looking like Sandra Bullock were all out of the question, I settled for the prospect of a little homemade joy. Beef-flavored joy. 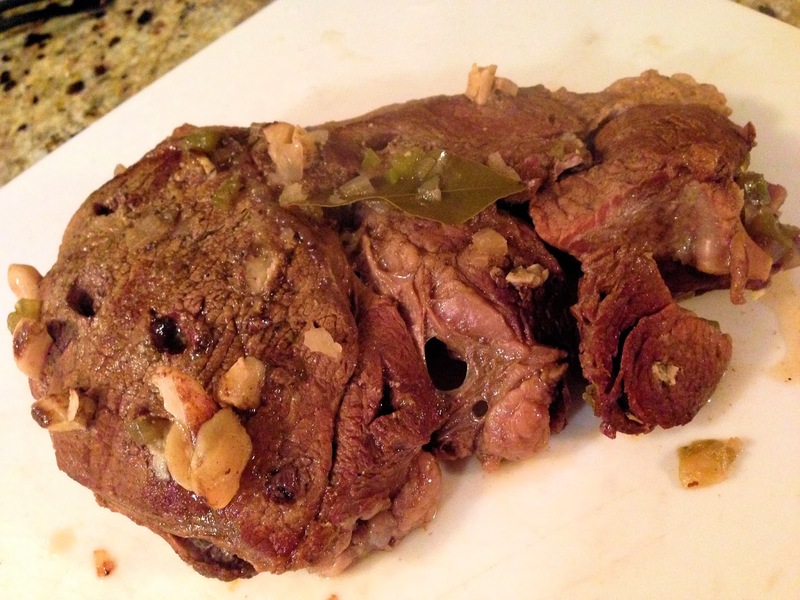 When inspiration hit me, I could almost smell the seasoned beef and garlic searing in the pan… I was salivating before I could get the beef out of the refrigerator. Serious garlic, Cajun heat, and the caramelized crust of a pan-seared beginning. Oh yes. Place the roast on a cutting board. Rub olive oil all over the roast. 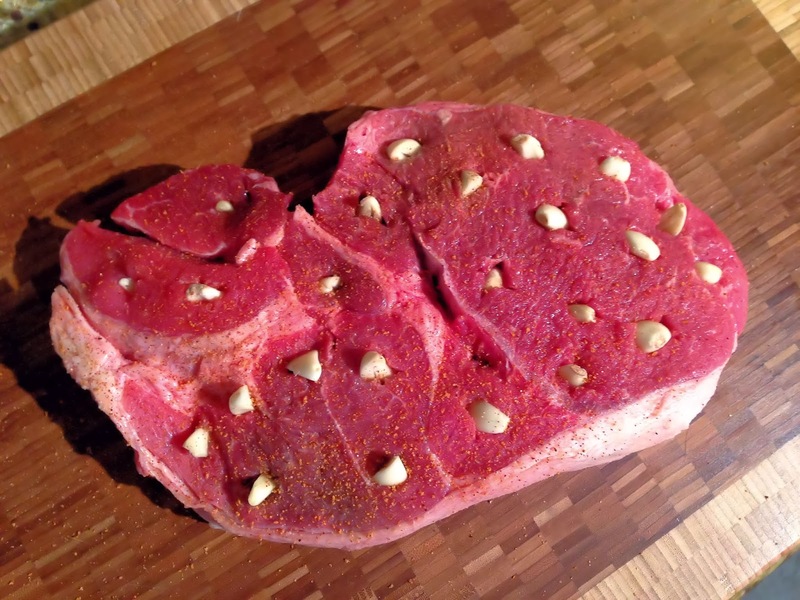 Using a paring knife, cut deep “x”s about an inch apart all over the meat. In each “x”, insert a garlic clove. Some of the cloves are larger – these can be halved. Once the garlic cloves are in place, generously season the meat on both sides with Tony Cachere's. Chop onions, celery and bell pepper; set aside. I like to use a small Dutch oven for this dish, such as Le Creuset (enamel-coated cast iron)…something that’s heavy duty and will retain heat. Heat the Dutch oven on the stovetop on medium-high heat. Use a dish that is close in size to the roast itself – you will not want too much extra space. Sear the roast on one side until medium brown. Stand back for a moment and savor the amazing aroma. You’re welcome. Carefully flip the roast (I like to use tongs) and sear the other side. Remove from pan, set aside on a plate. Add the diced onion, pepper and celery to the hot pan, and stir with a plastic spatula. Cook for about 3 minutes – veggies should begin to slightly caramelize on the edges. Add a cup of water to deglaze the pan. Add the can of beef consommé, red wine, bay leaves, and Creole Mustard. Place the roast back in the pan. Add enough water to come about halfway up the roast. Bring to a boil. Reduce heat, cover and simmer for 3 hours. Add potatoes, and simmer for an additional 30 minutes. Remove roast and potatoes; let roast rest for 10 minutes before carving. Meanwhile, transform the beef broth into gravy. I find the easiest way to do this is with a whisk and Wondra flour. Heat the liquid to a simmer, and simply shake Wondra directly into the pan and whisk as it thickens. Continue until it reaches the consistency you like.